A couple of weeks ago I made a date loaf. It got rave reviews on the recipe site, but I wasn't impressed by it. 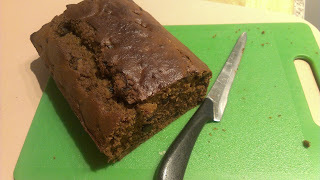 On a scale of 'sponge to mud' cake, I like my date loaf up near the mud cake end. This version was too close to the sponge cake end. Last week I made banana bread. Every one really enjoyed the recipe. The texture of the bread was far more like the texture I'm looking for in a date loaf. Instead of trying another recipe, I thought perhaps I could just substitute dates for bananas. It turned out okay. A little too sweet with the dates, and perhaps a little short on full date flavour. The original recipe and the date option. 3 or 4 ripe bananas, mashed. According to one site this is about a cup of banana. 3/4 cup sugar. Original recipe was for 1 cup. Even 3/4s was on the sweet side. 1.5 cups of cut dates soaked in 1 cup of boiling water. Next time I will put the soaked dates through the blender, which may help to 'spread' the flavour a little. 1/2 cup of sugar. This still way sweeter than necessary. Next time I will use only 1/4 cup. Stir in sugar, egg and vanilla. Sprinkle salt and baking soda over the mix and stir in. All stirring with a wooden spoon; no need for 'lectric. Pour into greased loaf pan. Bake for 1 hour. In my small oven, after about 40 minutes I need to cover with foil to prevent the top from burning. Eat lots of it. Good warm straight out of the oven. Good the next day with butter on it.